Despite the odd title, which refers to one of the guiding principles of scientific and philosophical inquiry, this is an accessible collection of essays, ideas, and personal experiences. As far as author Bill Jay is concerned, photography encroaches on all aspects of life, and he touches on a wide range of topics. He addresses young photographers in particular, whom he advises that "each photograph you take is like a pebble dropped into the pond of consciousness, its never-ending ripples lapping upon everything." The book is illustrated with Jay's wonderfully inventive montages of Victorian wood engravings, which alone are almost worth the price of the book. 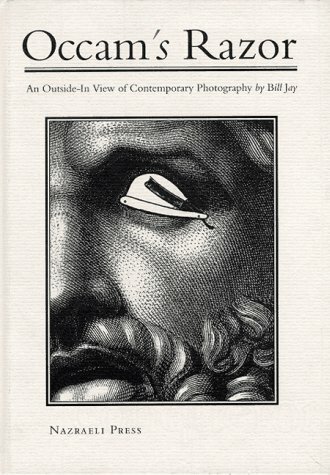 In this fascinating collage of essays, photographer Bill Jay touches a multiplicity of areas of photography, ranging from personal reminiscences of Diane Arbus and W. Eugene Smith to essays on photographic craft, art criticism and The Family of Man. Jay's narratives are serious and intriguing with a healthy dose of light-hearted humor.